So, first the Mario Kart stuff. 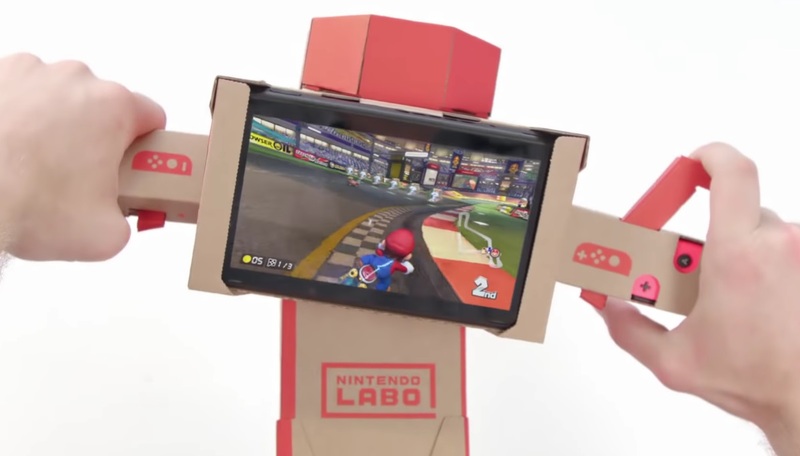 If you have Mario Kart 8 Deluxe for the Switch, and you really should because it’s excellent, you can now use the Toy-Con (buildable with the Labo Variety Kit) as a sort of real-world controller. You twist the right “handlebar” to accelerate and rotate the whole thing to turn. This is the first game to get its own special Labo support, but the company says more are on the way. Splatoon 2, perhaps? The first challenge is to create a musical instrument with the Toy-Con pieces and “craft materials.” You’ll have to document its creation and show it working on video; it’ll be judged on “Quality, Creativity, Spirit, and Sound.” Caps Nintendo’s. The second challenge is to create a game or game-like experience using Toy-Con Garage. Same judgment categories as before, minus Sound. There will be one grand prize winner and four runners up per contest. Grand prize is that amazing Switch (approximate retail value $1,000?! ), plus a cool (?) Labo jacket. Runners up get a pair of cardboard style Joy-Cons and a jacket. Respectable. If you’ve been looking for a reason to pick up that Labo kit again or use some random pieces you never tried, this is surely that reason. Now get to work!